Late Winter, Early Spring at Taughannock Falls State Park near Ithaca, New York. Nikon D700/28-300VR, 4s, f/22, ISO 200, EV 0, 28mm focal length, tripod. In John Denver’s Rocky Mountain High album, he wrote a series of songs and music called the Season Suite. The track titled Late Winter, Early Spring was a guitar instrumental and is a lovely piece of music which captures the feeling of time between the snow melt of winter and the greening of springtime. This is the music that was going through my head as I was photographing at Taughannock Falls last weekend. Below is a video done for an album of John Denver’s songs by his concert and album music arranger, Lee Holdridge. Lee was a long time friend and collaborator who came out with an album of John Denver’s songs performed by an orchestra he conducted. I have the original vinyl record. I am guessing when John saw the final video I have linked to below, he would have uttered his famous line, Far Out! Enjoy! 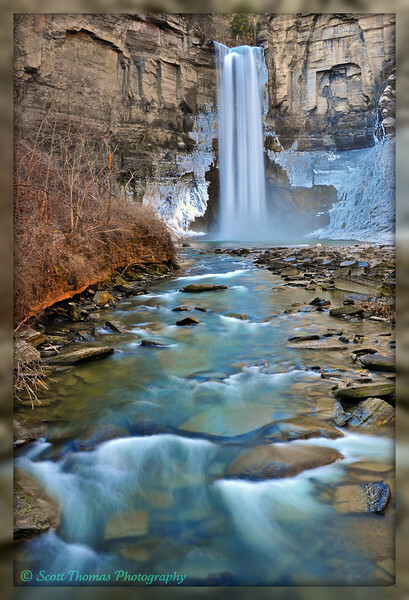 This entry was posted in Nature and tagged 28-300mm, creek, flowing, gorge, ice, ithaca, long exposure, new york, nikon D700, rocks, spring, state park, taughannock falls, tripod, vr, water, waterfall, winter. Bookmark the permalink. Just re-read this and the following post . . . and I like this image best. Carl Sagan would definitely think an alien race had lived here. Scott, the waterfall is gorgeous, especially with the wall of ice on both sides.